Manley Bros. of Indiana, Inc.
Manley Bros. of Indiana, Inc. is Located 10 Miles North of Interstate 80 and 3 Miles West of Interstate 39. Health and Safety of our employees and customers is a significant concern for Manley Bros. We would encourage all our customers to read and understand the SDS, (found on this Web site) and follow the recommendations of the N.I.S.A. 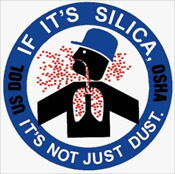 Occupational Health Program for Exposure to Crystalline Silica. If you have any questions regarding Health and Safety of our products please do not hesitate to call (815) 539-7486. Quality is our top priority at Manley Bros. of Indiana, Inc. We are proud to say we are an ISO Certified company.